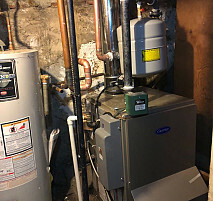 With over 25 years experience in the HVAC industry, Accurate Temperature prides itself on being dependable, reliable and providing our customers with value and savings. Our commitment to our customers is unsurpassed. With our ability to provide our customers with good quality service at a fair price, we believe that you will return to us for all of your air conditioning and heating needs. We provide quality installations for complete systems or an outdoor replacement of an existing system. We fabricate duct work to your home to get the best air flow possible. 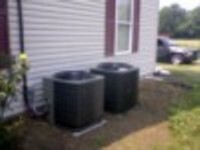 Custom system designs specifically for your system needs and air flow problems. We are confident in our retro fit experience when it comes to replacing your existing outdoor unit or indoor heater and/or coil. 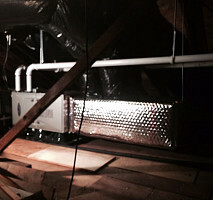 Attic system installations are also available. High velocity systems can be designed to meet your needs. 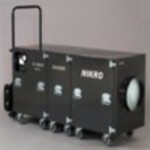 Conversion from oil to gas or from gas to electric can be designed and installed. 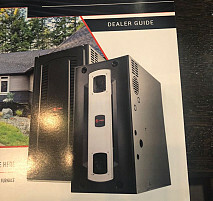 Or if you just want to breathe easier with an Aprilaire humidifier or Electronic Air cleaner can be installed at very reasonable prices. We offer with each new system a manufacturer's warranty of 10 year part and 10 year compressor. A 10 year quality pledge from the manufacturer means that the entire outdoor unit would replaced in the 9th year if compressor should go bad. We stand by our commitment to providing you a quality system at a fair price. With an initial service visit the customer can expect to pay very reasonable rates for service charge and labor. 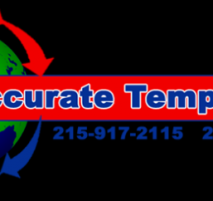 Also, in addition to outstanding service at affordable prices, Accurate Temperature offers 24 hour emergency service. 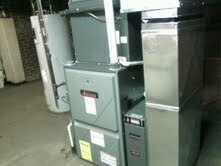 Servicing and installing high efficiency air conditioners, and high efficiency condensing furnaces. Environmentally friendly Puron with the 14seer units and higher. 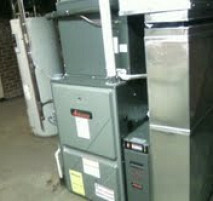 Or maybe you just want the heater or air conditioner checked for piece of mind and savings. 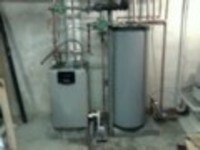 We also can install and service your water heater as well as your hydronic heating system such as a boiler, and all zone controls. Servicing all brands including Carrier, Lennox, Bryant, Trane, York, Amana, Weil McLain, Gibson, Goodman, Tappan and many more. Service Plans are available. 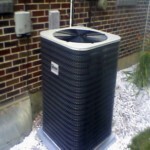 Heat pumps are installed and serviced as well as forced air furnaces. 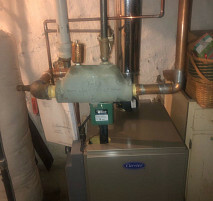 Heater checkups are performed for safety and efficiency, providing our customers with peace of mind that their heater will be reliable and safe for the upcoming season. 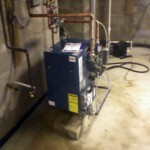 Hydronic boilers are serviced and installed as well as hot water heaters with outstanding manufacturer's warranties. As an added service we also have state of the art duct cleaning equipment with rotary brush capability. Our duct cleaning is unsurpassed by any other contractor. With a discount on an electronic air cleaner to maintain indoor air purification after duct cleaning is completed. We also offer a free heater cleaning with the purchase of a rotary brush duct cleaning. We would like to have the opportunity for you to see for yourself how far your money goes with Accurate Temperature from our quick reliable service to our quality HVAC installations. Customer satisfaction is our highest priority. We recommend to all of our potential customers to price shop and compare. We are confident that you will see how far your dollar goes with choosing Accurate Temperature for all of your air and heating needs. We would like to have your business and keep your business for many years to come. Thank you for taking the time to read about Accurate Temperature. Comments: Very professional and honest. My friend recommended Accurate Temperature because my heater is old and was running slow. I got Jeff on the phone and he got someone out the next morning to help me with my problem. He also gave me some tips to help the current situation, and some things to help keep my house warm when it's cold. Very understanding of my difficult situation. Thanks Jeff. Work Description: Accurate Temperature replaced my Heater and AC on July 28, 2016. Jeff the owner and Ron a technician came. Jeff gave me a great deal. Ron and Sunny showed up on time. The service was professional and friendly. They finished the work very fast and answered all my questions. Very professional, efficient technicians. It's a pleasant to find a trustworthy business. I highly recommend Accurate Temperature as they did a GREAT job for me. 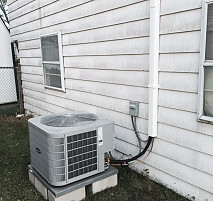 Work Description: Installation of a Gree outdoor heat pump related to 5 mini-split units. Comments: Jeff was the first to call. He was professional and agreed to help me out at the last minute. He was very forthcoming and explained everything up front. The technician who did the install was punctual and professional. I will definitely use Accurate again. Work Description: I already had the problem diagnosed. So all he had to do was put in a new fan inducer. That's get the part and install it. I was charge $280.00 He did a great job but he was expensive. Others quoted me $253.00 and $225.00 He came out fast, same day, maybe even the same hour and got the job done. Even though they were expensive I was very pleased. They sent out a very nice guy. 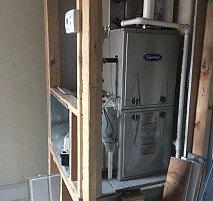 Comments: Job was done professionally at a competitive price by Jeff and his associate from Accurate temperature. Comments: My experience with this company was nothing but positive. From the very beginning with the price quote and explanation of the work to be done, Jeff Taylor was knowledgeable, completely up front and honest and true to his word when it came to scheduling and carrying out the installation. At every step of the process, he carefully explained what was happening and the job was finished on time. The work was exceptional. I would highly recommend this company to anyone. Work Description: I had a duct cleaning done by Accurate Temperature. Comments: The men were very professional in clean uniforms. They put drop cloths down where the brought materials in. They were thorough with there work ethic. They answered all my questions with precise answers. They showed me the dirt in the machine before and after. Showed me the video camera they had put in the duct system. I was extremely happy to recommend Accurate Temperature or use them again for other services. Work Description: I had A/C and heater installed, I truly would recommend accurate temperature, The price and work was really great. Jeff return my call the same day. Work Description: Accurate Temperature provided a quote for services. At this time no decision has been made yet whether to accept or reject the bid. Comments: Accurate Temperature was very quick to respond to the request for a quote. They promptly contacted and dialogued with me through email and were able to stop out at the house within 48 hours for an evaluation. I found the gentlemen who performed the evaluation for quotation to be knowledgeable, professional, and friendly. They were able to submit a quote to me through email within 48 hours. The quote was concise and detail oriented. None of the other 3 contractors ever emailed me. I would give Accurate Temperature an "A+" for their efforts in trying to win my business. 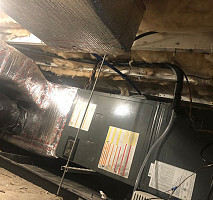 Work Description: Accurate Temperature recently installed a heater and coil 2 years ago. Then recently had a roto brush duct cleaning done. Comments: The workmanship is terrific. I am really happy with the way the heater works. As far as the duct cleaning, it made such a difference in how I feel with my allergies. I highly recommend Accurate Temperature. Owner of Accurate Temperature Jeffrey Taylor.